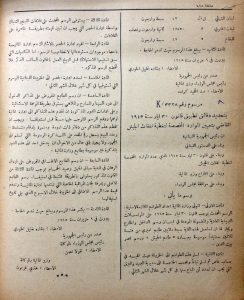 With great pleasure I present Wissam Lahham as a new contributor to the historical-postal research of Lebanon. Wissam is a resercher and lecturer at the political science institute of USJ in Beirut. His contributions will be of the highest documentary value. 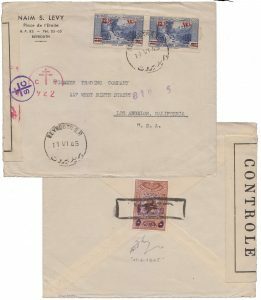 The army postal tax stamp (Yvert n 197, Michel n 1, SG n T289, Scott RA1), cedar design with Beit-Eddin palace overprint additionally surcharged “Army stamp” in Arabic (5p on 30c) is a bit illusive regarding the date when it was first used (fig 1). 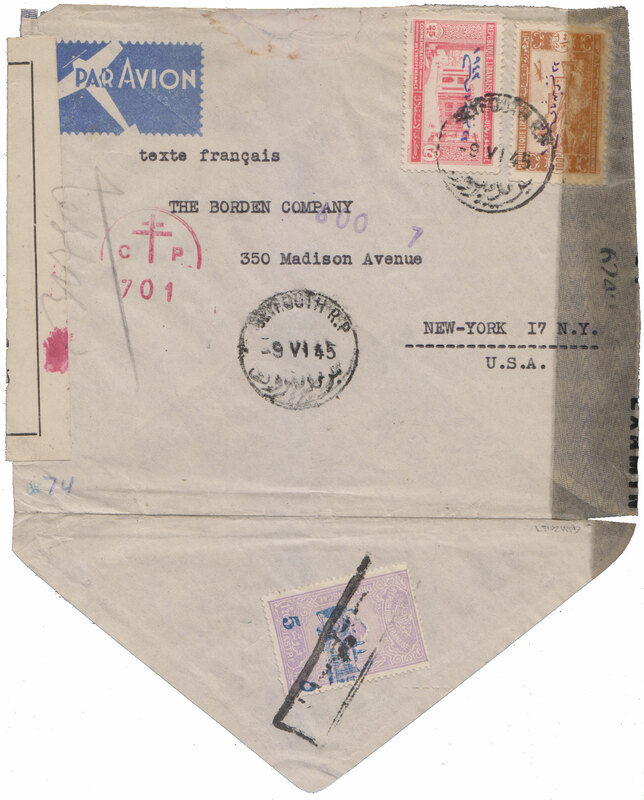 The first reported use of the above mentioned stamp appears on a cover dated 11 June 1945 (fig 2). 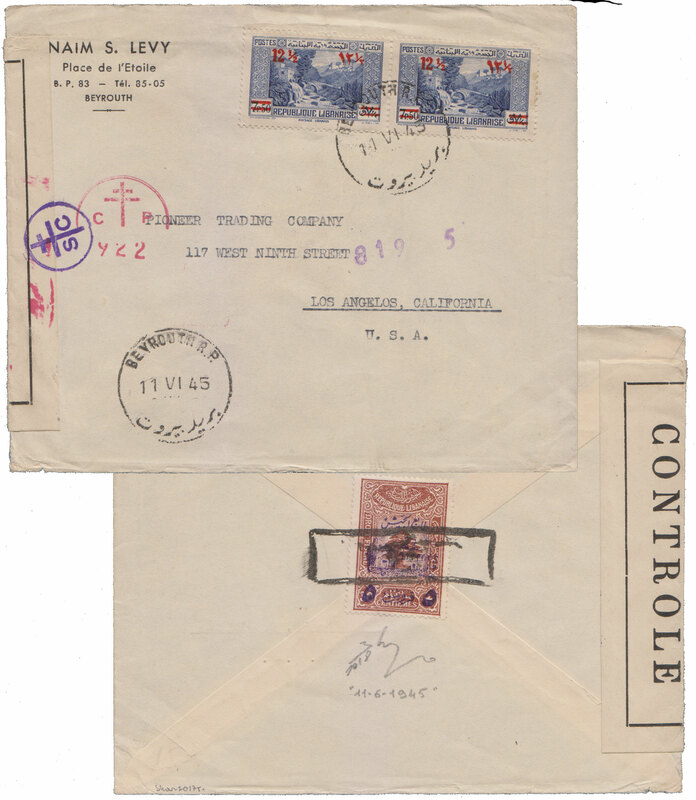 The problem emerges when we know that an ordinary fiscal stamp surcharged in western an Arabic numbers (5p on 1p20, Duston 146) was used as early as the 7th of June 1945 (fig 3) and also later on several recorded covers (fig 4). This discrepancy needs a clear explanation to justify the use of two different stamps: the ordinary fiscal stamp starting the 7th of june and the army stamp tax later on the 11th june. 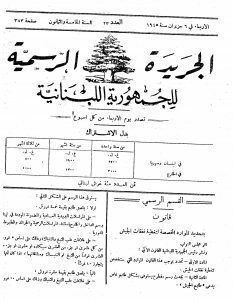 The political independence of Lebanon achieved in November 1943 was far from complete. 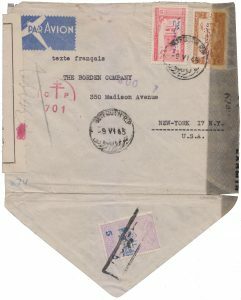 Many public sectors remained under the direct control of the French mandate authorities such as customs, concessionary companies and public security. 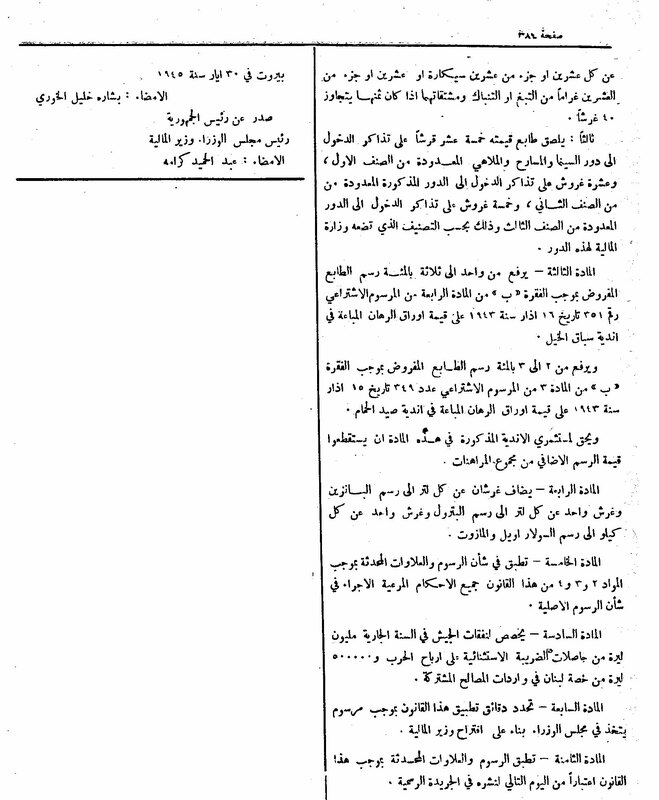 The Lebanese government demanded that all administrations should be under its control especially the army. The situation was further complicated when on 14 may 1945 a body of Senegalese troops (1200 soldiers) arrived in Beirut to reinforce the French army in the country. This incident provoked a violent reaction from both the Lebanese and Syrian government considering it a direct violation of their respective sovereignty. 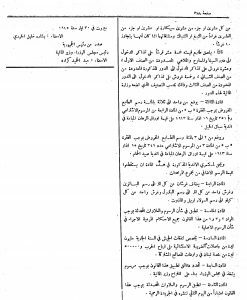 Thus the parliament convened and voted a law to cover the needs of the future Lebanese army demanding once again that the French authorities should hand over Lebanese soldiers to the control of the government. The law was voted on the 29 may 1945. 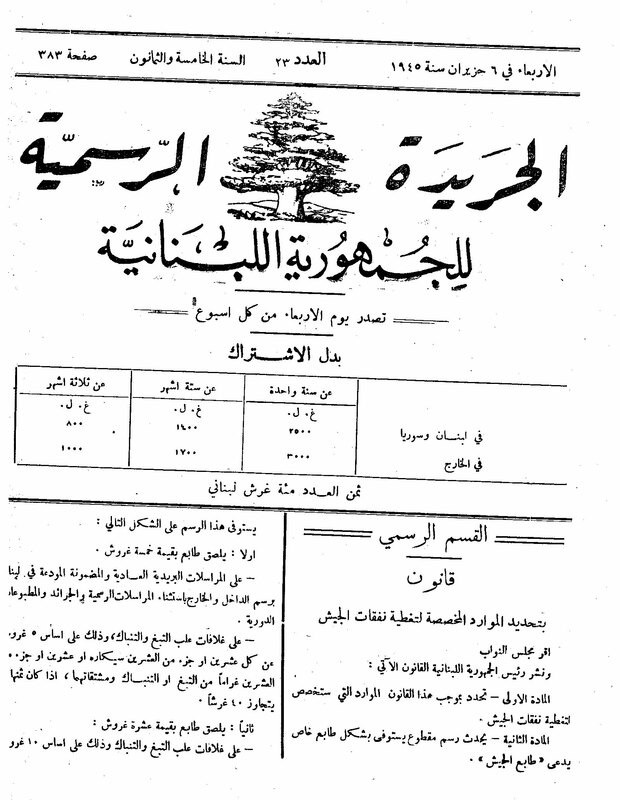 Article 2 created a wide range of taxes to finance the army and assure that once under Lebanese authority it will have all the proper means to function adequately. 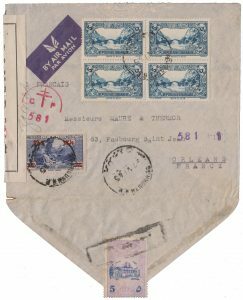 Among these measures an army tax stamp was created to be compulsory on all normal and registered mail both domestic and foreign (official mail and daily newspapers were exempted). 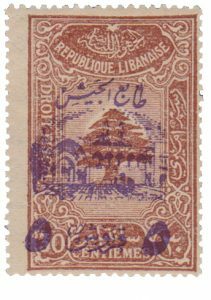 Article 8 of the law specified that all new taxes will be implemented the next day following its publication in the official gazette. The law was published on the 6 of June 1945 (fig 5 and 6) and thus it went into effect on the 7 of the same month. This fact explains why the first use of ordinary fiscal stamp was recorded on the 7 June. On 9 June 1945 decree number 3328 was promulgated fixing in its first article that a total amount of 7’000’000 ordinary fiscal stamp (30c value) should be transformed to serve as the newly created army tax stamp with the 5 Piasters overprint (fig 7). Hence, the overprinting process was only sanctioned on the 9 June that is two days after the law came into effect on the 7th. Taking into account that printing the new value on the stamps began on the 9th it becomes comprehensible that the new army stamp was first introduced later on June 11. We can conclude with certainty that post offices used the ordinary fiscal stamp from 7 to the 10 June as a contingency measure until overprinting was over and the new army stamp was delivered to post offices starting 11 June 1945. 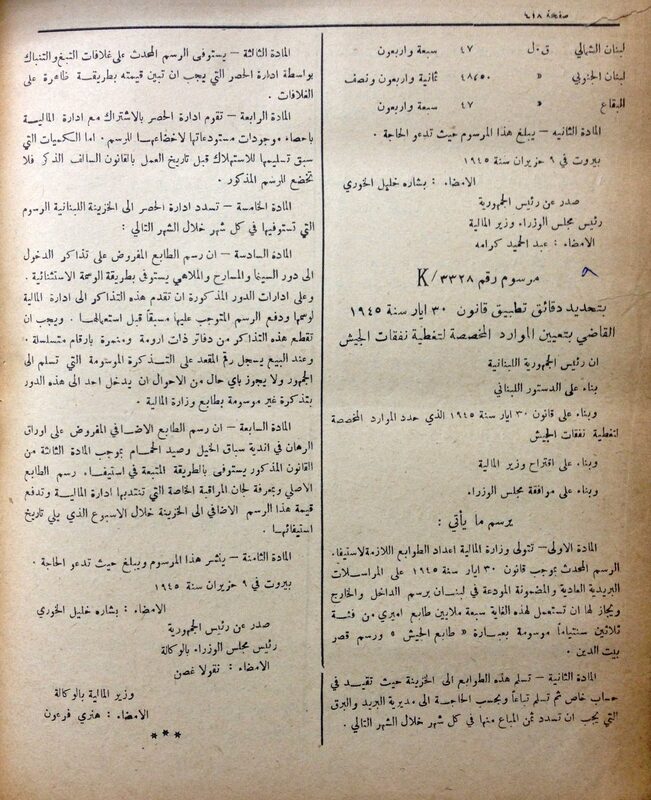 It is worth noting that Lebanese troops (5000 soldiers) were officially handed over to the government on the first of august 1945.